Even though former NFL tight end Aaron Hernandez is in prison for life for another murder, he might get off for the double murder that happened in Boston 2013 as stated by YAHOO Sports. 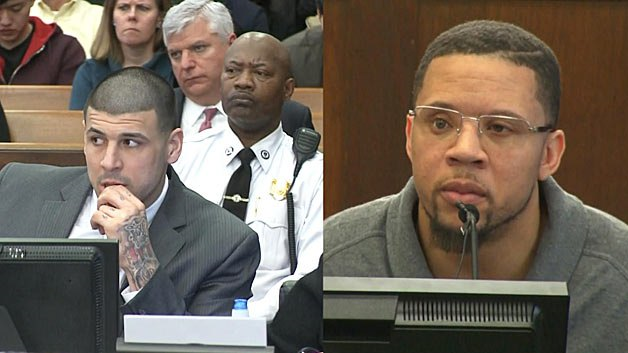 The star witness, Alexander Bradley, has testified against his former best friend that Hernandez shot him in the face after mentioning the double murders after Hernandez thought he was being watched by undercover cops. It has been brought up, however, that Bradley sent a text message to his attorney fearing he would face perjury charges if he told the truth about not being able to recall if Hernandez did in fact shoot him. YAHOO Sports reports that the text sent to his lawyer said, “Now u sure once I withdraw this lawsuit I wont be held on perjury after I tell the truth about me not recalling anything about who shot me”. Bradley claims it was a miscommunication and that he wanted to tell the jury he was unsure who shot him so Hernandez wouldn’t have to face criminal charges but it would put him at risk for perjury because he already said Hernandez shot him. Bradley has testified for over six hours and the mother of his child as almost testified against Hernandez. Hernandez’s defense team argue that Bradley is untrustworthy and a killer. Bradley is a two-time convicted felon and is currently serving a five-year sentence in Connecticut for a 2014 shooting in Hartford.